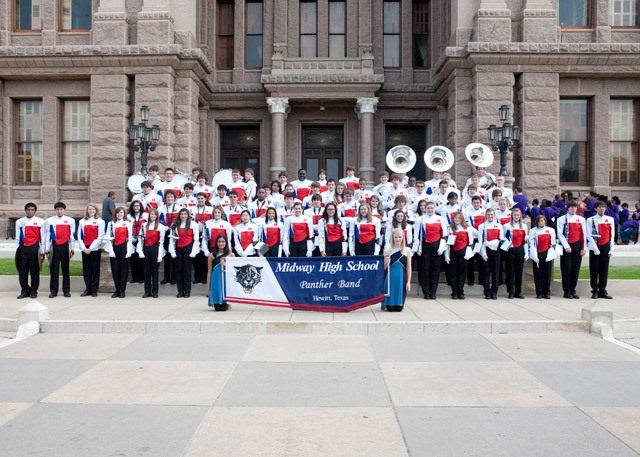 The Midway High School Band of Waco performed on the steps of the State Capitol in Austin on Friday, May 25th. 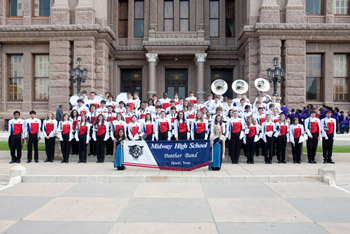 The band entertained the crowd with patriotic songs and after the performance, they toured the Capitol. The Waxahachie 2011-20112 Leadership Class met with Senator Brian Birdwell and Representative Jim Pitts recently at the capitol. 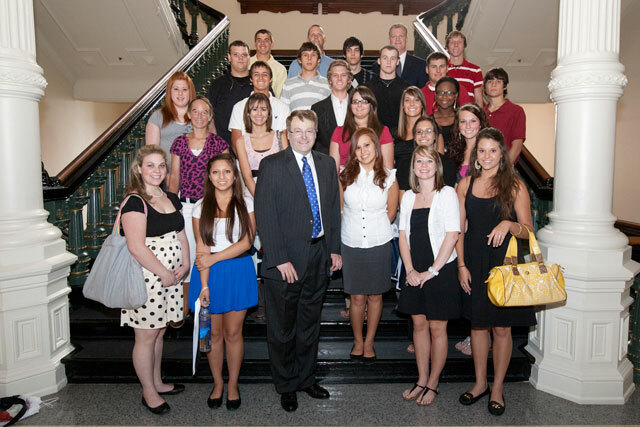 After a tour of the capitol and the Supreme Court, where Supreme Court Justice Dale Wainwright addressed the group, the Class attending a "Star of Destiny" film about Texas in the Spirit Theatre at the Bob Bullock State History Museum. 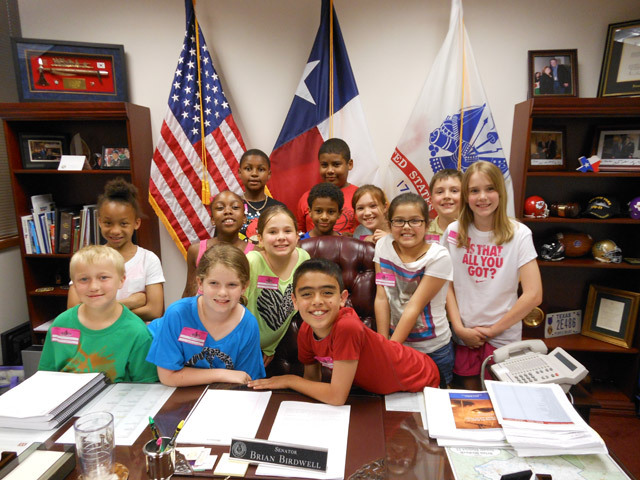 Recently, 4th grade students and parents from Children's University in Arlington dropped by the capitol office to see Senator Birdwell's office. 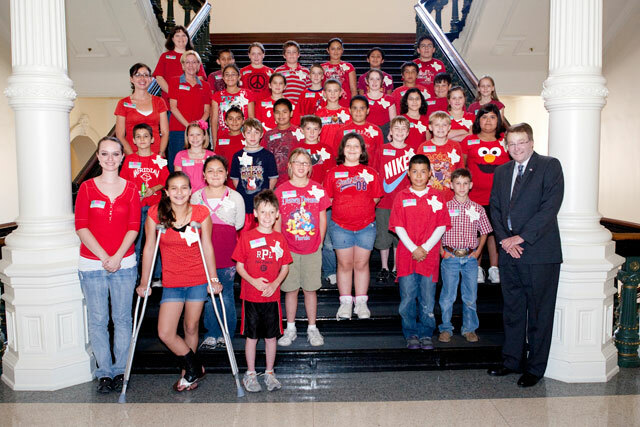 These 4th graders are classmates of Senator Birdwell's nephew, Nick Birdwell. 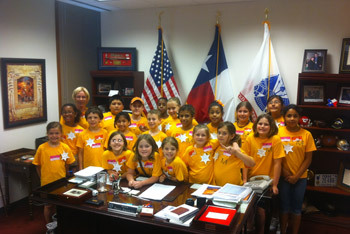 They were visiting Austin on a "Texas History Trip" with their teacher, Angela Fang. 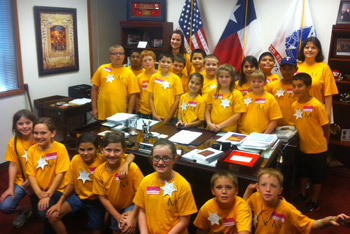 They enjoyed seeing the office of their friend's uncle and having their photo taken behind the Senator's desk. 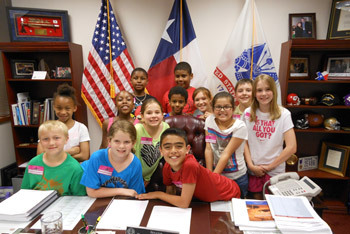 Fourth grade students from Meridian Elementary School visited the Capitol recently, and came by the Senator's office. The students have been studying Texas History, and the trip to Austin helped to make history come alive. 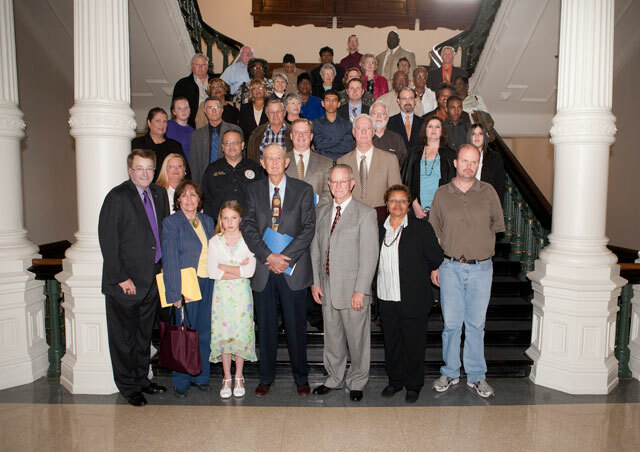 Recently, the 2011-2012 Midlothian Leadership Class visited the State Capitol to learn about the legislative process in the State of Texas as part of the Leadership requirements to graduate from the program. 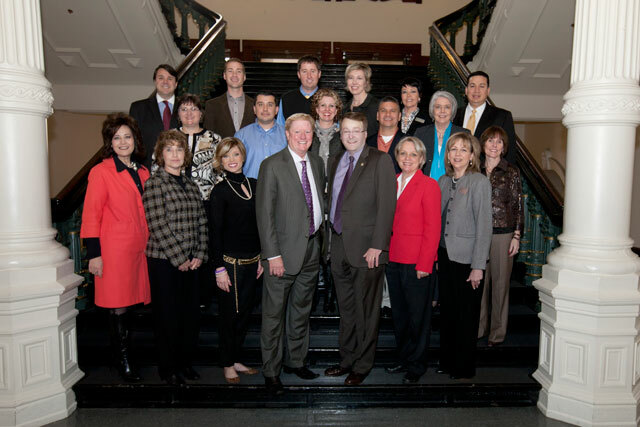 After meeting with Senator Brian Birdwell and Representative Jim Pitts, they toured the Capitol Visitors' Center and afterward went to the Texas State History Museum. 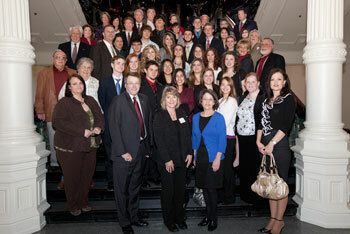 Hillsboro Junior High students came to the capitol with the Hillsboro 2011-2012 Leadership group to meet with Senator Birdwell and Representative Pitts. 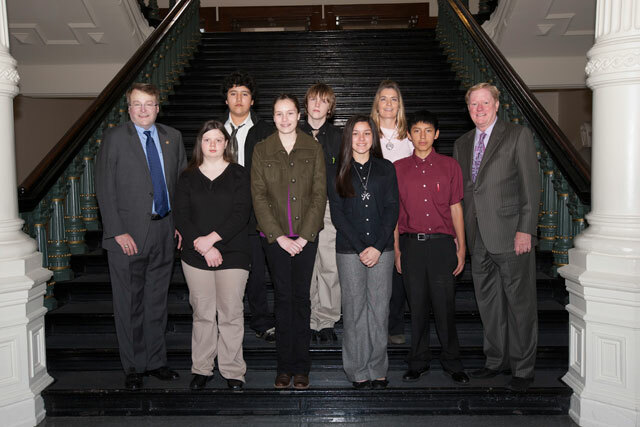 These students represent the top 3 girls and the top 3 boys academically, and were awarded a trip to the State Capitol and to the Bob Bullock State History Museum for this accomplishment. Their Principal, Cathy Patterson is also in the photo. 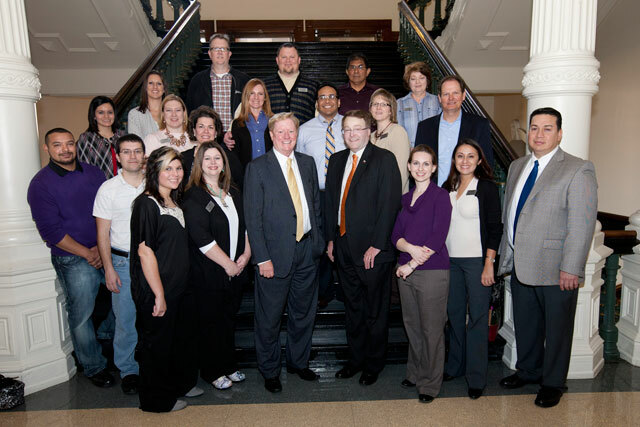 Members of the 2011-2012 Hillsboro Leadership Class came to the Capitol recently and met with Senator Brian Birdwell and Representative Jim Pitts. Former graduates of the Leadership Class, who serve as Advisors, also were in attendance. The group had a full day of meetings and tours to learn more about state government. They had lunch in the Lt. Governor's Reception Room and toured the Speaker of the House's living quarters in the capitol. 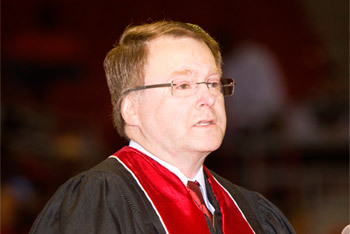 Senator Birdwell addressed graduates and guests at Lamar University's winter commencement ceremonies Dec. 17 in the University's Montagne Center. 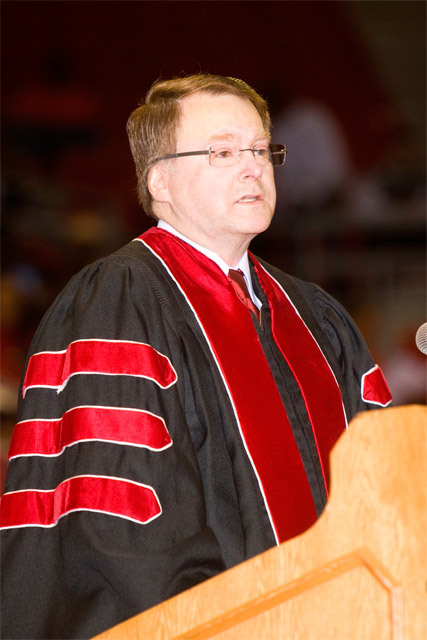 The Senator graduated from Lamar University in 1984. 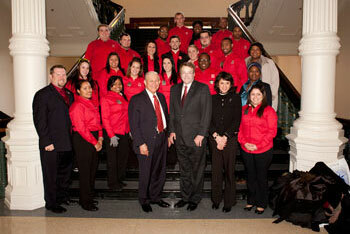 Senator Birdwell and Dr. James M. Simmons, President of Lamar University. The Senator was the speaker at the University's December 17, 2011 winter commencement ceremonies. 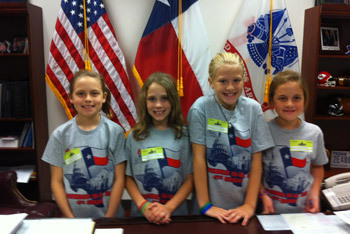 Fourth graders from Stribling Elementary School in Burleson, participated in Education in Action's "Proud to be Texan" – Austin program on 12/9/2011. Participants visited the Texas State Capitol and the Bob Bullock Texas State History Museum to experience what they are learning in Texas History. Senator Birdwell provided Texas Capitol workbooks for each of the students. These fourth grade students, along with 120 other students from the Academy at Nola Dunn in Burleson, came to the state capitol recently for an educational field trip. 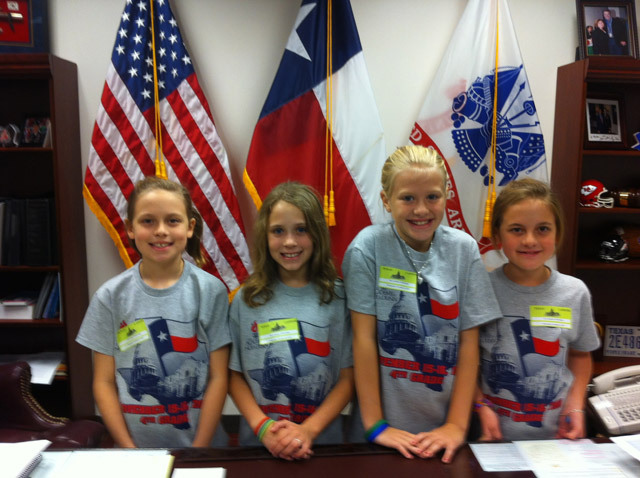 These girls pictured visited Senator Birdwell's office, had photos taken, and learned about the Senator and Senate District 22, which includes Burleson. 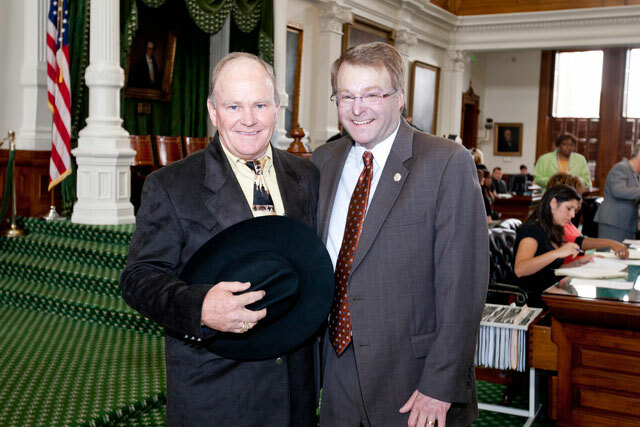 The Texas Senate honored Coach Randal "Whoa" Dill whose Navarro County Bulldogs baseball team won the 2011 National Junior College Athletic Association Division I World Series championship title in Grand Junction, Colorado on June 4th. Pictured (from right to left) is Dr. Richard Sanchez, President of Navarro College, Coach Whoa Dill, his wife Candi, his parents Joy and Randal Dill, and Senator Birdwell. The Bulldogs defeated the number-one-ranked Central Arizona College team by a score of 6-4 in the bottom of the 10th inning before a crowd of 11,000 to bring home Navarro College's first national baseball championship title. Gale Thompson Sayers, her daughter Ashley, and a family friend, Shaina Rusten, visited Senator Birdwell and toured the Capitol during the recent Special Session, which adjourned Sine Die June 29, 2011. 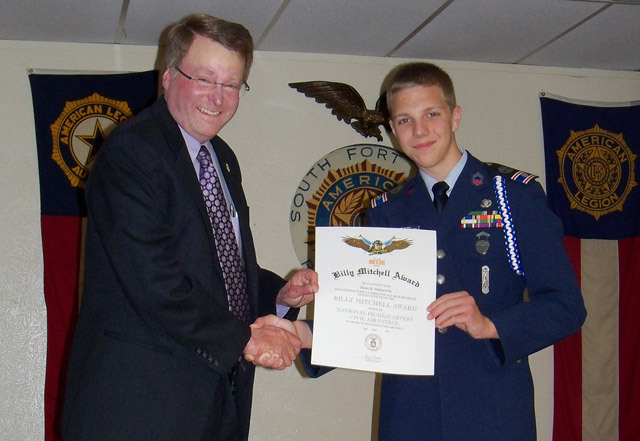 I had the honor of presenting the Billy Mitchell Award of the Civil Air Patrol to Cadet 2nd Lieutenant Henry Malinowski from Mansfield. 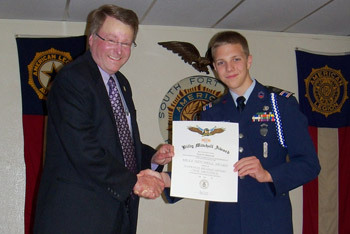 He is a great reflection of the youth of our nation that has interest in a military career. 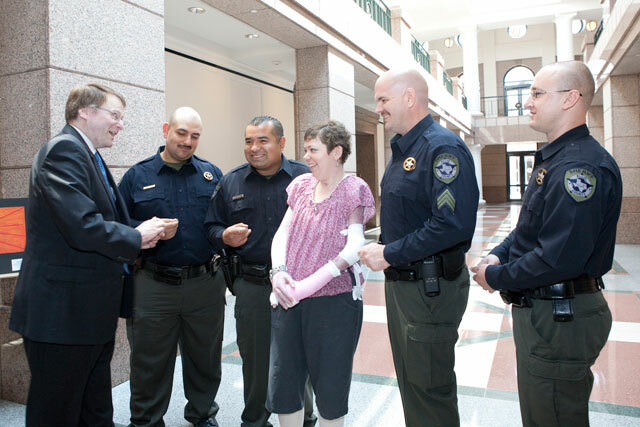 On June 3, 2011, at the State Capitol, the Texas Commission on Law Enforcement Officer Standards and Education (TCLEOSE) awarded Ellis County Sheriff's Deputies the State of Texas 2010 Law Enforcement Achievement Award for their bravery and decisive actions that saved Jamie Nash's life. 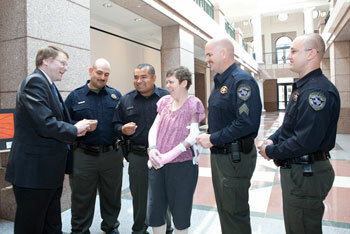 (From left to right) Corporal Patrol Jeremie Atilano, Deputy Patrol Manuel Valdez, Sergeant Patrol Bryan McGee and Deputy Patrol Ryan Connelly risked their lives in 2010 to rescue Jamie Nash (center), who was trapped in her blazing vehicle due to an automobile accident, and saved her from certain death. Jamie spoke at the Awards Ceremony and praised the Deputies for their valor and congratulated them on their much-deserved statewide recognition. 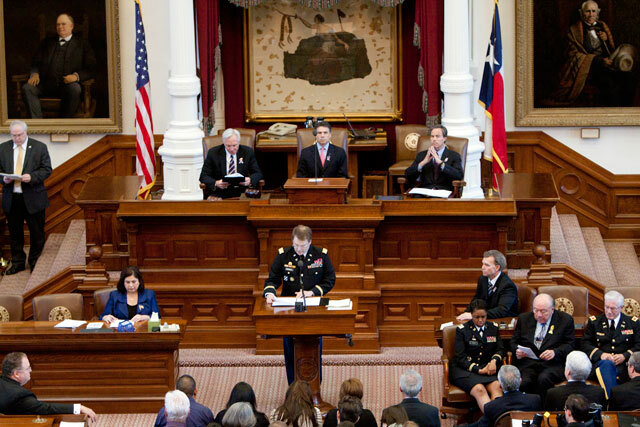 On Saturday, May 28th, as part of the Memorial Day commemoration, the Senate and House held a joint session to honor the fallen heroes of Texas. 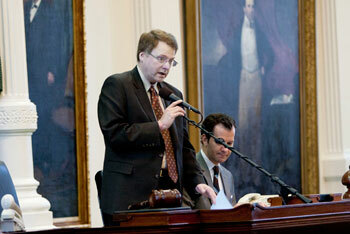 Picture at the dais are Governor Perry (center), President Pro Tempore of the Senate, Senator Ogden (left), and Speaker Strauss (right). 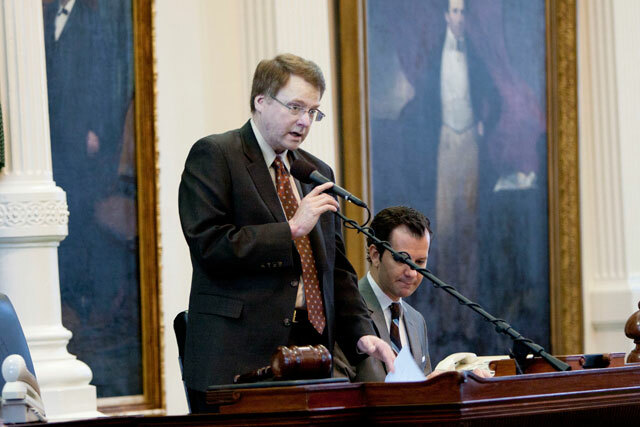 Senator Birdwell and Representative Berman, each a career military officer from their respective Chamber, read the names of the fallen heroes whose families were unable to attend the ceremony. 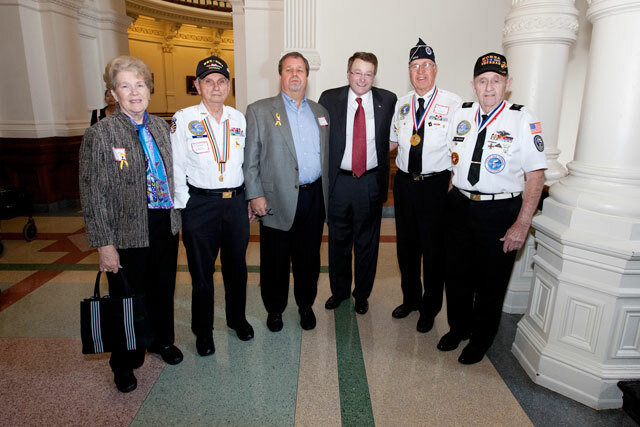 Senator Birdwell was privileged later to join Governor Perry in expressing solemn condolences to three families of heroes from Senate District 22 who fell in the last 2 years during the Global War on Terror. Pastor Danny Reeves of the First Baptist Church of Corsicana served as Pastor of the Day in the Texas Senate recently and Pastor Reeves' wife and children, pictured here, accompanied him to the Capitol. Reverend Danny Reeves of First Baptist Church of Corsicana and Senator Birdwell after Rev. Reeves offered the Invocation in the Senate Chamber. 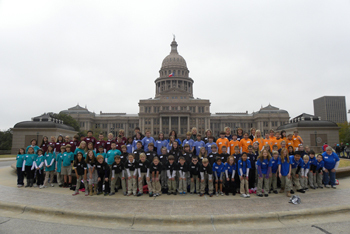 Fourth grade students from Meridian, in conjunction with their study of Texas history, came to Austin for an educational field trip recently. 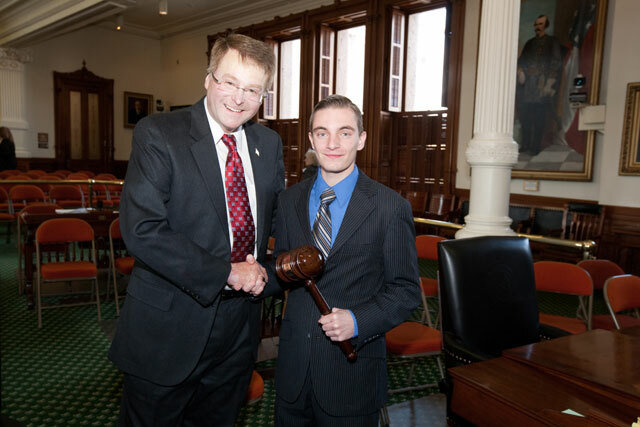 The group visited the Bob Bullock Museum, the Capitol Visitors' Center, observed the Senate in session, and met with Senator Birdwell. 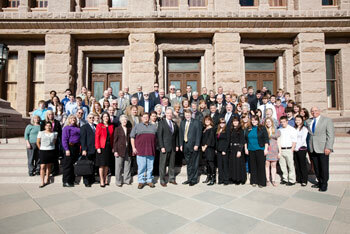 The Coryell County Rising Republicans visited the Capitol recently for the Texas GOP High School Group Day. 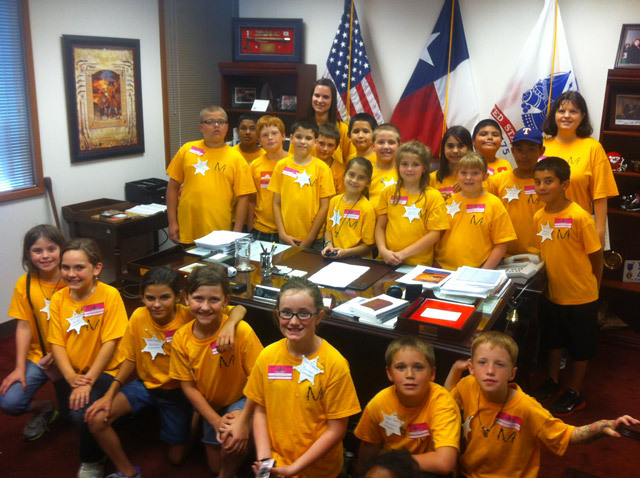 While in Austin, they watched the legislators in action in the House and Senate Chambers, visited with Senator Birdwell outside the Senate Chamber, and toured the Capitol. 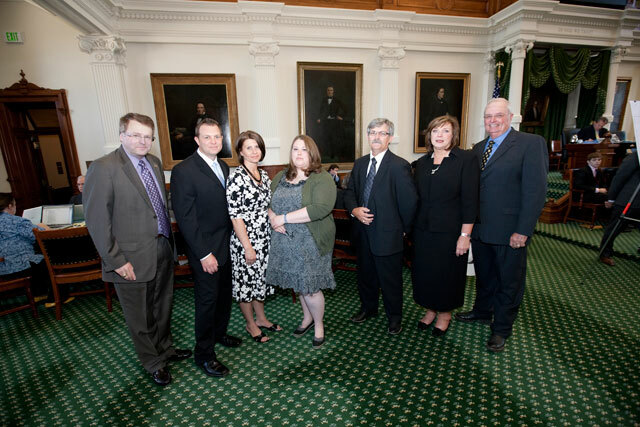 The family of Deputy Clifton Taylor was in Austin recently to attend the Department of Public Safety Memorial Ceremony for fallen officers and to be honored in the Senate Chamber by Senator Birdwell. Johnson County Deputy Sheriff Taylor was killed April 23, 2011 in the line of duty at the age of 31 years of age. He was greatly respected and admired by his colleagues and all who knew him, and his death is a tragic reminder of the sacrifices made daily by the members of law enforcement and their families. 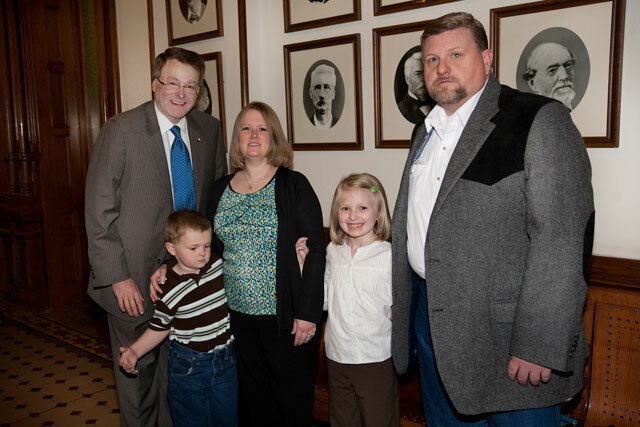 His father and mother Randy and Rebecca Taylor, his brother and sister-in-law Christopher and Monika Taylor; and his fiancée Rhonda Cox were present to hear the Memorial Resolution read in the Senate along with Johnson County Sheriff Bob Alford, who accompanied the family. 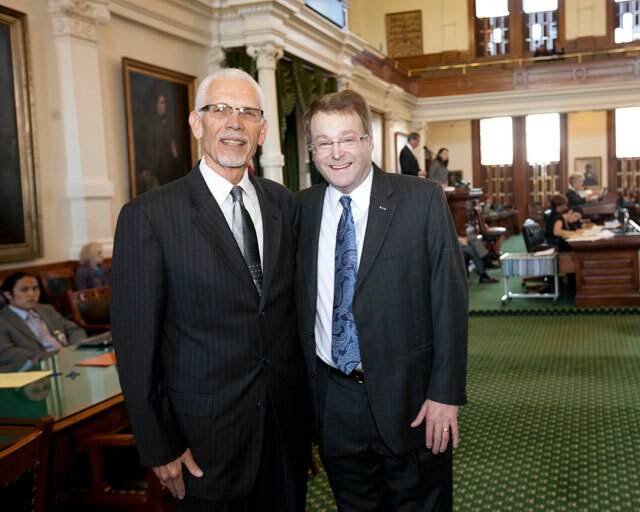 The Reverend Billy Sanders, pastor of the North Pointe Church in Copperas Cove, served as Pastor of the Day in the Senate recently and offered the invocation in the Senate Chamber. 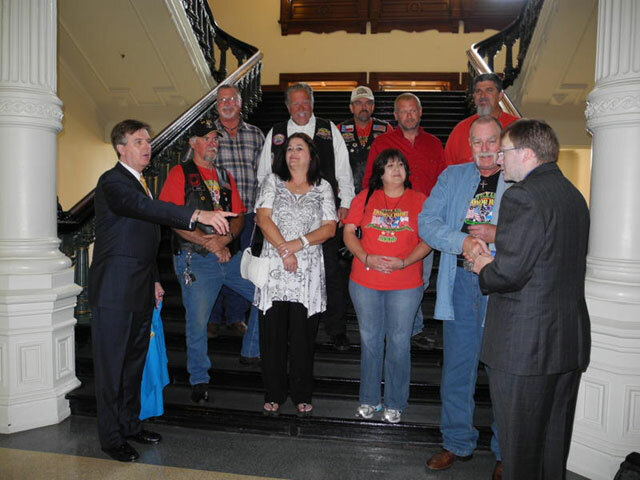 Texas Honor Ride members met with Senator Dan Patrick and Senator Birdwell recently. 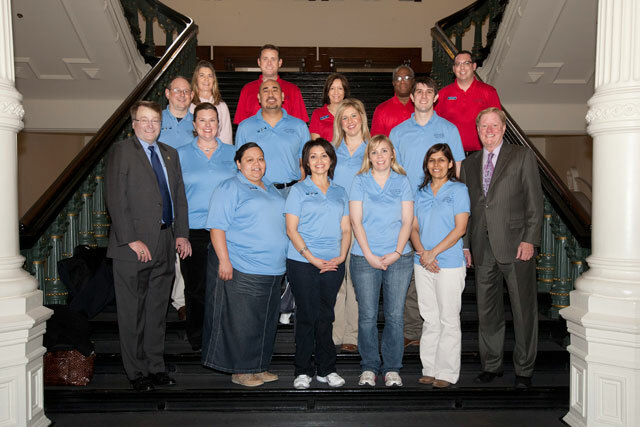 The Texas Honor Ride, a 501 (c)3 charity, honors, directly helps and improves the quality of life of wounded warriors and their families who are recovering at the Brooke Army Medical Center in San Antonio. 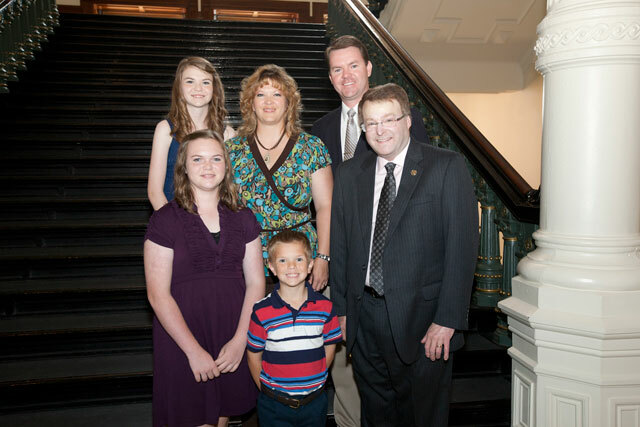 Reverend Russ Weaver, the pastor of the Shepherd's Valley Cowboy Church in Cleburne, served as Pastor of the Day recently. Pastor Weaver is a true cowboy, as he is a former PRCA calf roper. The Korean War Veteran Association Chapter 215 members met with Senator Birdwell: Annette White, Byron White, Larry Kinard, Jr., Senator Birdwell, Larry Kinard and William Hoyle. On Friday, April 29, 2011 the Texas Senate honored Korean War Veterans. 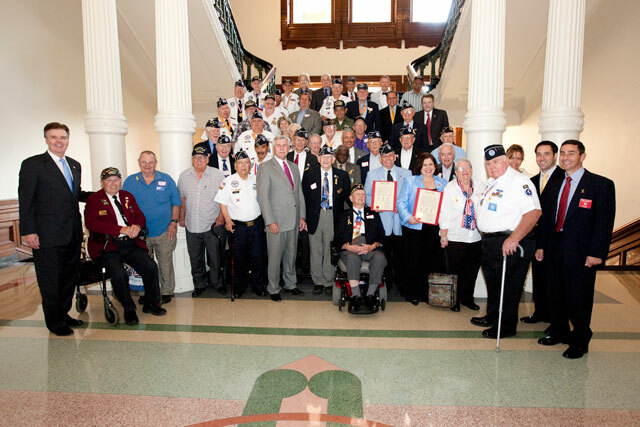 It was a great privilege to have the opportunity to say thank you for their service to their country and to let them know that the Korean war is not forgotten in the heart of Texans. 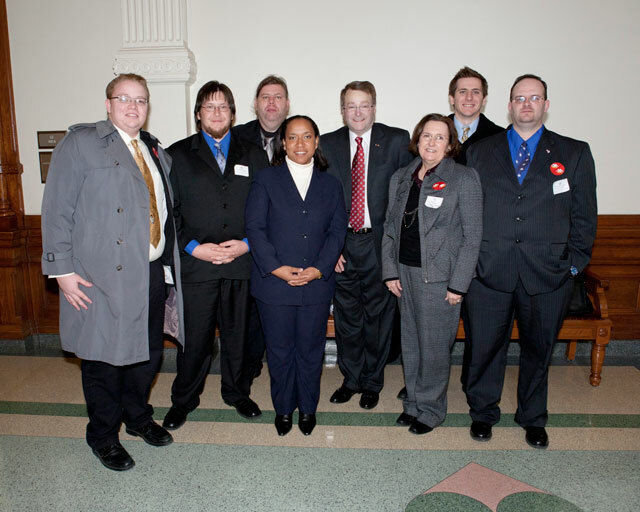 Pictured with the Veterans are Senators Dan Patrick, Troy Fraser, Brian Birdwell, Leticia Van de Putte, Joan Huffman, and Glenn Hegar. 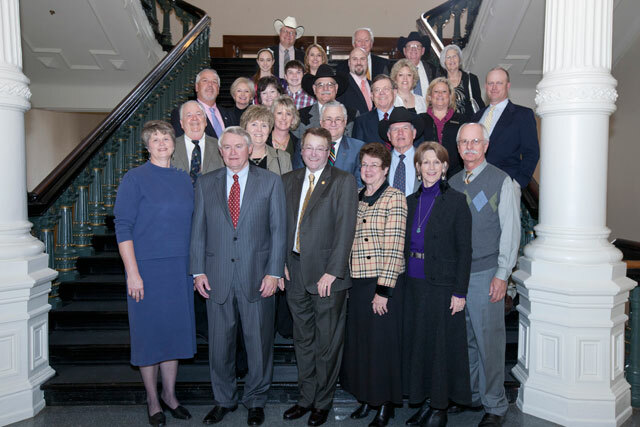 Texas Farm Bureau members from the counties of Bosque, Coryell, McLennan, and Falls (District 8) came to the capitol to meet with Senator Birdwell to discuss the legislative priorities for farmers throughout the state of Texas. 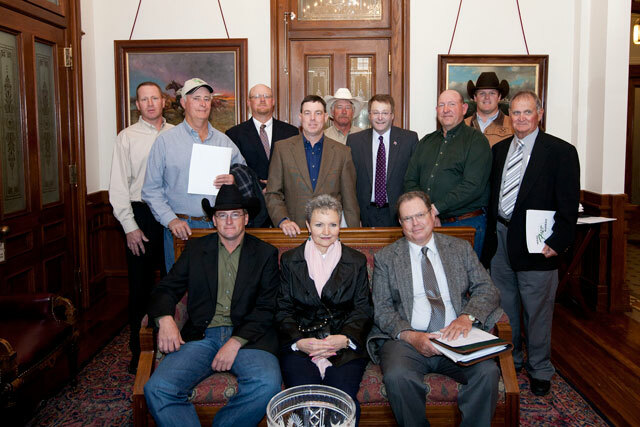 They discussed their support for Senate Bill 332, as well as the issue of landowners' ownership interest in the groundwater below their land. Autumn Parker from Midlothian served as an Honorary Page in the Texas Senate recently. 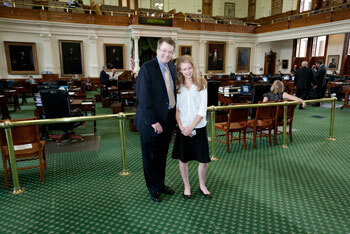 I was pleased she was able to come to the capitol and observe the Senate in session. The Bosqueville High School seniors visited the Capitol recently as part of their economics/government studies program. 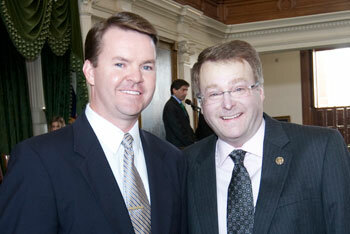 Accompanying them were Bosqueville ISD Superintendent James Hopper and Mike Finnell, Government and Economics teacher. After Senator Birdwell met with the group, the students observed the Senate in Session. 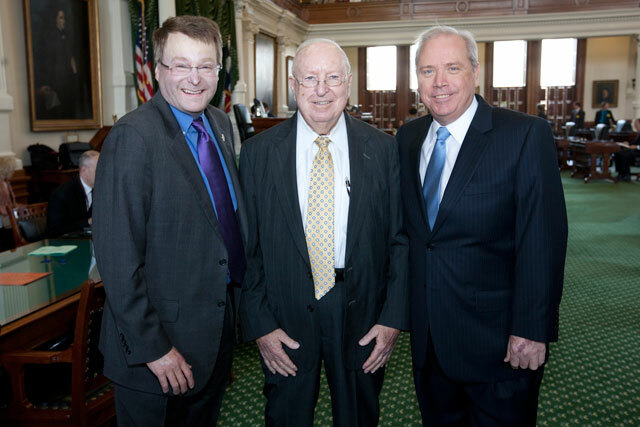 Dr. James Barnes, Pastor Emeritus of the Southwestern Assemblies of God University, served as Pastor of the Day in the Texas Senate recently. 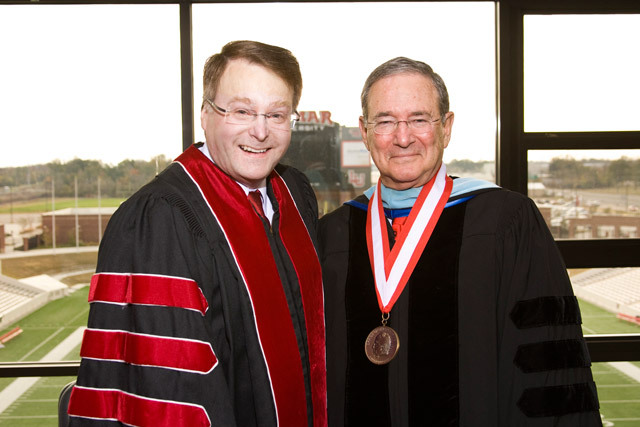 He has also been instrumental in helping colleges gain accreditation to earn university status for 30 years. 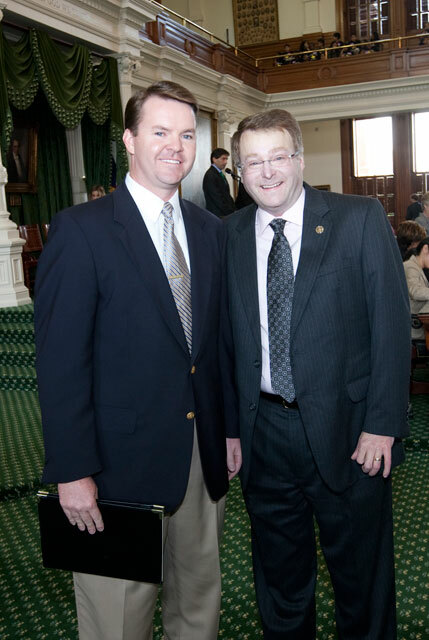 Having Dr. Barnes serve as Pastor of the Day had a special meaning for Senator Birdwell, as he was Brian Birdwell's minister when the Senator was a child. 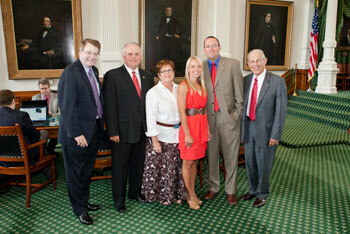 Also included in the photograph is State Representative Gary Elkins, a long-time friend of Dr. Barnes. I was very honored to preside over the passage of Local Calendar bills in the Senate Chamber. 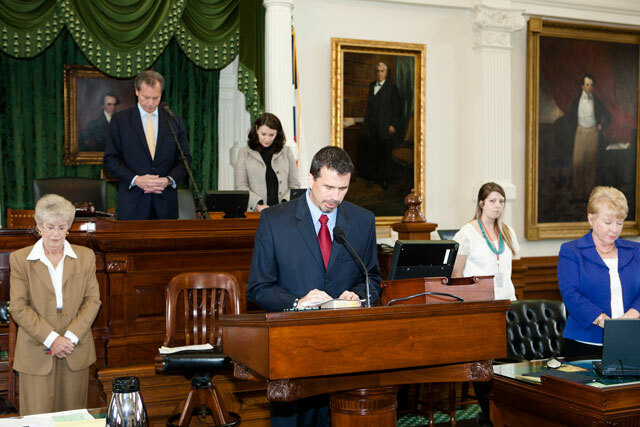 Pastor Jim Gray, Associate Pastor for Senior Adults at First Baptist Church in Woodway, served as Pastor of the Day in the Senate Chamber this week. 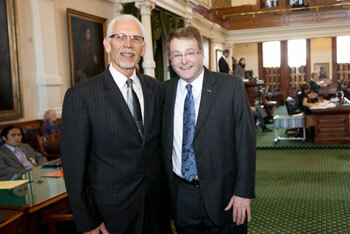 I was very pleased that my good friend offered the invocation in the Senate. 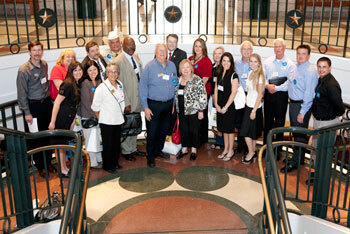 April 12, 2011 was Texas Association of Realtor Day at the State Capitol, and Senate District 22 was well-represented by realtors who came to Austin from Hood, Johnson and Ellis-Hill Counties. Senator Birdwell met with the realtors, who presented their legislative priorities and expressed support of certain bills that the Texas Legislature is considering this Session. 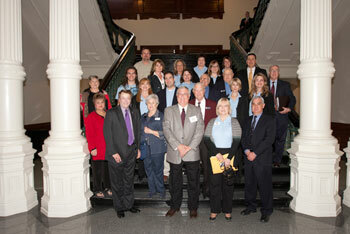 Recently, representatives from Texas State Technical College (TSTC) came to the Capitol for TSTC Day. 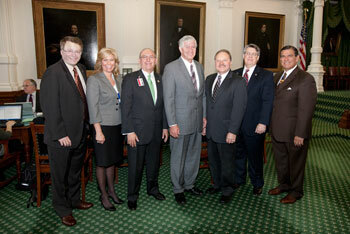 From left to right, bottom row - Dr. Elton Stuckly, President of TSTC Waco, the Board of Regents Joe Hearne, Senator Birdwell, Chairman Rolf Haberecht, J.V. Martin, and TSTC Chancellor Mike Reeser. On the second and third rows are the Student Ambassador group and their Faculty Advisor Autumn Outlaw. 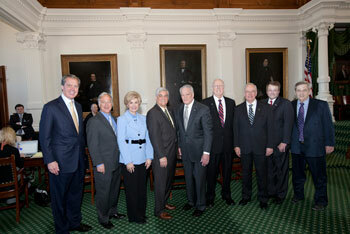 The Texas State Technical College (TSTC) Presidents were honored in the Senate Chamber recently. 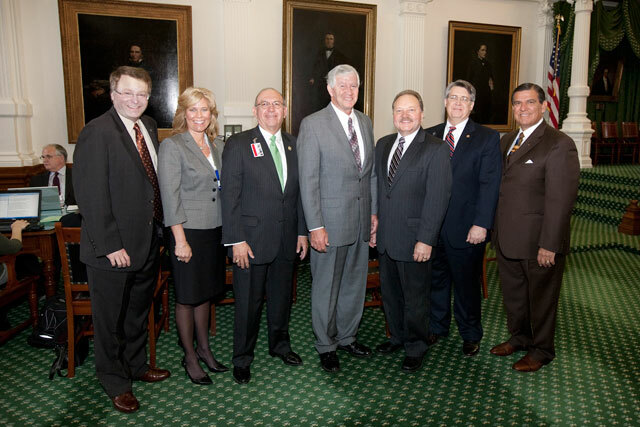 Pictured, from left to right are Senator Brian Birdwell, TSTC West Texas President, Gail Lawrence; TSTC Harlingen President, Dr. Cesar Maldonado; TSTC Marshall President, Colonel Randall Wooten; TSTC President Waco Dr. Elton Stuckley; Chancellor Mike Reeser; and Senator Eddie Lucio. A delegation of citizens and elected officials from Corsicana and Navarro County came to the capitol recently on Corsicana and Navarro County Day. 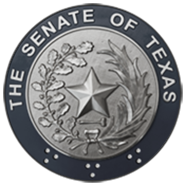 The group met with Senator Birdwell and his staff, and also heard from representatives of several agencies on current issues the state is facing. 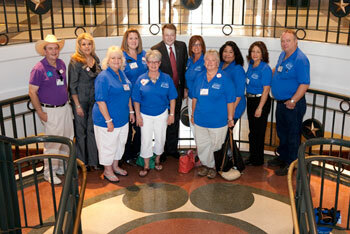 The group picture with the Senator was taken in the outdoor rotunda in the Capitol Extension. Senator Birdwell and Representative Keffer welcomed a large group from Hood County to the State Capitol on March 2nd - Texas Independence Day. 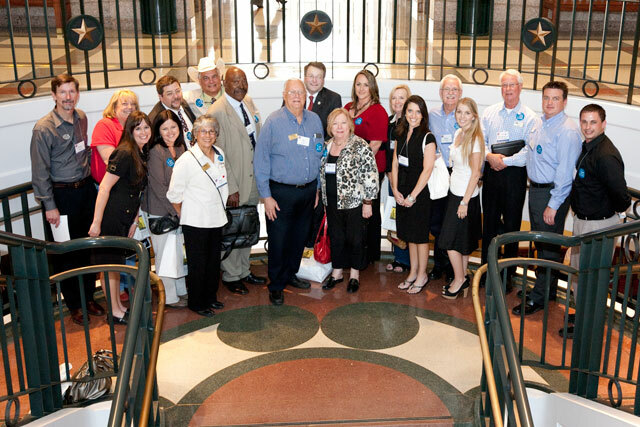 The Lake Granbury Chamber facilitated the trip, which was very well attended by virtually every elected official in Hood County as well as members of the Junior Leadership, and many other citizens. 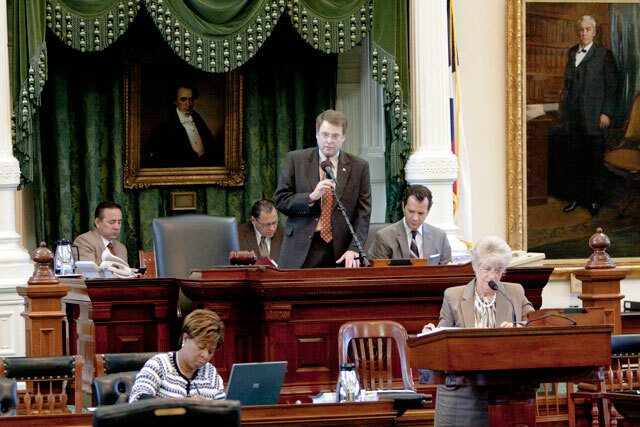 After an introduction in the Senate Chamber, the group heard presentations regarding the issues of redistricting and the state budget. 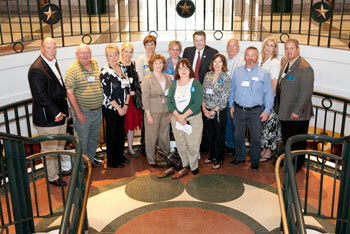 The Cleburne Chamber and the Cleburne Tuesday Forum groups visited the Capitol and were introduced in the Senate by Senator Birdwell. 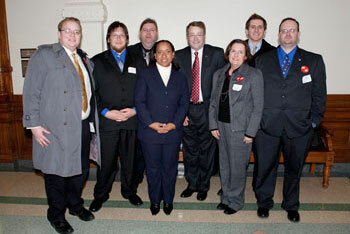 The groups heard presentations on the state budget and attended committee hearings. Coach Leta Andrews of Granbury High School was honored at the Texas Capitol on March 2, 2011 for her accomplishment as the most victorious coach in American High School basketball history. 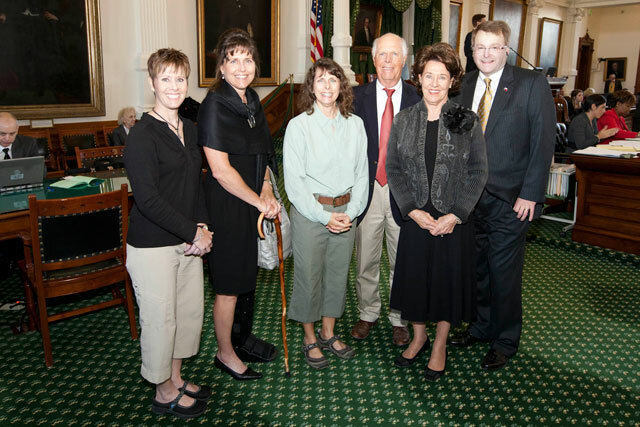 She is shown here on the floor of the Senate Chamber with Senator Birdwell, her husband David, and daughters Sissy, Linda and Lisa (from right to left). 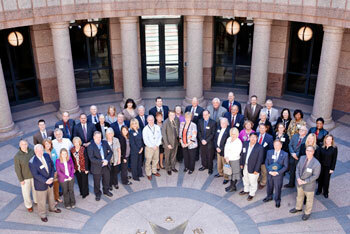 Hill County Day at the Capitol was attended by the largest delegation from the county ever to come to the Capitol. 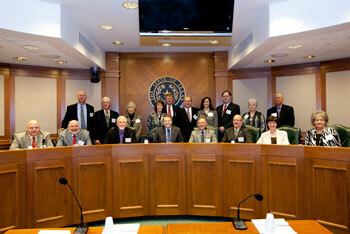 The group was introduced in the Senate by Senator Birdwell and also in the House of Representatives. Many elected officials, high school and junior high students, local citizens as well as Leadership Hillsboro were part of the impressive group. 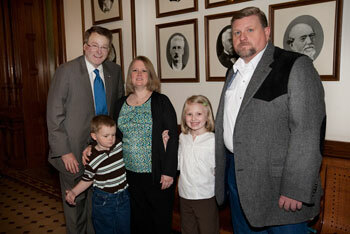 Senator Birdwell visited with the Seay family of Hillsboro when they participated in Hill County Day at the Capitol. 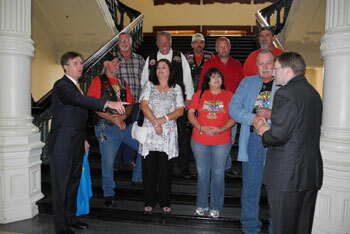 After the visit, the Senator presented a flag and certificate to the boy to celebrate the child's first trip to the Capitol. 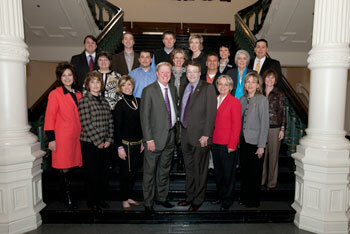 The City of Ennis and the Ennis Chamber of Commerce Leadership Class came to the Capitol February 17, 2011. 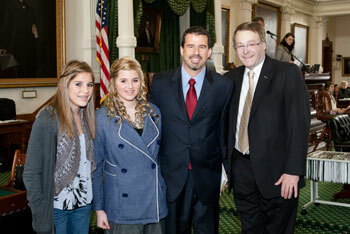 The groups were recognized in the Senate and met with Senator Birdwell. 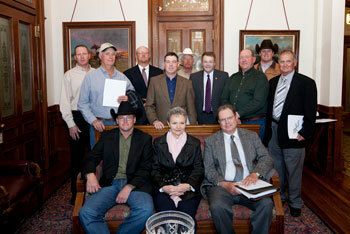 A delegation of constituents from Falls County, including Marlin and several other cities came to the Capitol in February, 2011. 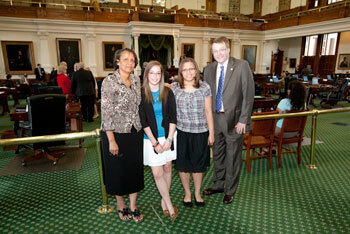 They were recognized in the Senate by Senator Birdwell. Representatives from the Texas Department of Rural Affairs and Texas Department of Criminal Justice spoke to them about relevant current issues. 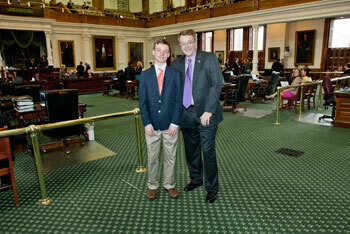 Cooper Nall of Waco served as an Honorary Page in the Senate recently. As a Page, he was able to be on the Floor of the Senate to assist the Senate Messengers and to observe the Senators at work. 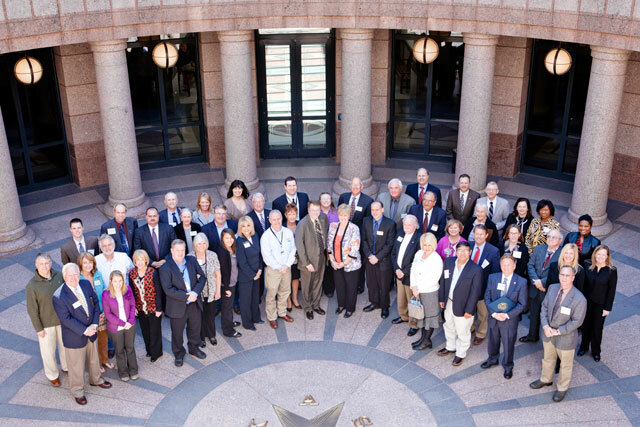 Representatives from the Texas Electric Cooperatives who are from Senate District 22 came to the capitol to meet with Senator Birdwell recently. 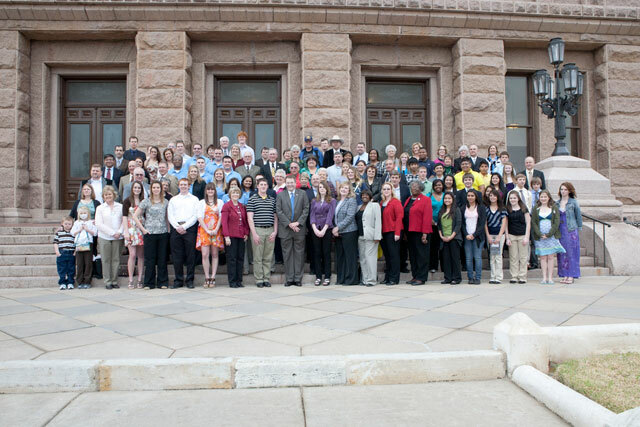 TEC is a statewide organization dedicated to representing the interests of cooperative electric utilities in Texas and the member-consumers. 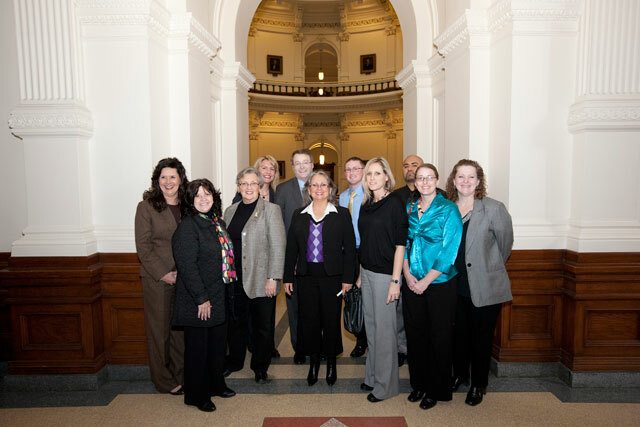 Members of the 2010-2011 Leadership Cleburne class came to the capitol to increase their knowledge of vital public issues and to visit with the leaders who are making decisions that affect their community. A delegation from Bosque County and Clifton came to the capitol in January and were recognized in the Senate Gallery by Senator Birdwell. Reverend Forrest's daughters with Senator Birdwell and their father in the Senate Chamber. 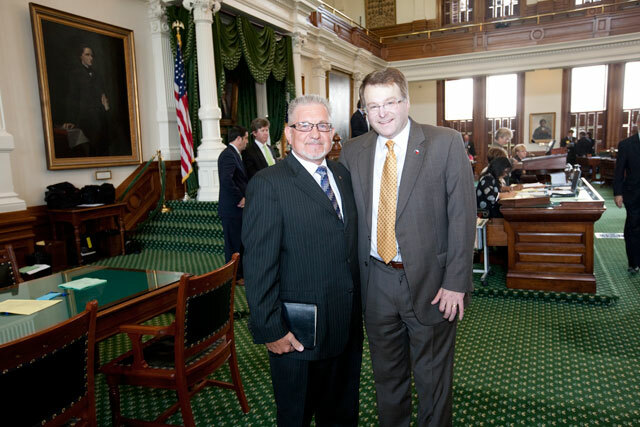 The Reverend Mark Forrest of the Lakeside Baptist Church in Granbury, Texas served as Pastor of the Day in the Senate February 9, 2011 and offered the invocation. 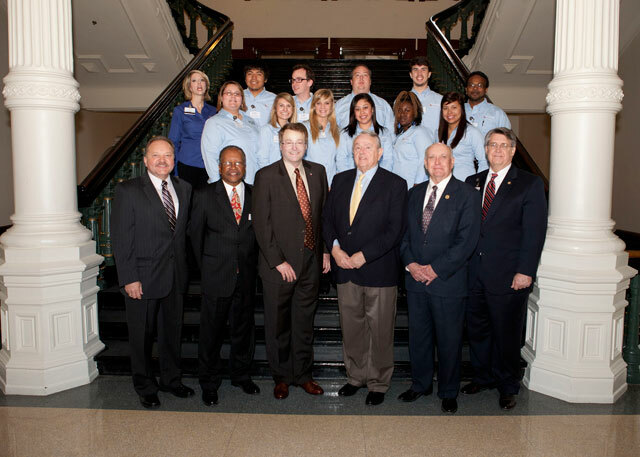 Senator Birdwell welcomed Dr. Johnette McKown, President of McLennan College, and the McLennan College students who were recognized in the Senate Gallery on Community College Day at the Capitol February 2, 2011. 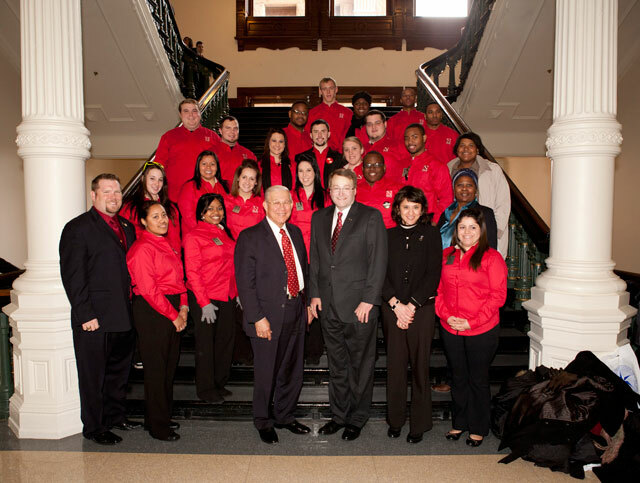 Senator Birdwell welcomed the Navarro College students and Dr. Richard Sanchez, President of the College who came to the Capitol on Community College Day February 2, 2011. The group was recognized in the Senate Gallery. Lt. Governor Dewhurst, Senators Birdwell, Chris Harris and Kirk Watson welcomed the President of Baylor, Kenneth Starr, and Harold Riley, Rick Riley, Gale Galloway, and Tommye Lou Davis to the Senate on Baylor Day. Senator Birdwell with Chad Kelley, who volunteered as an intern during the summer and during his school's Christmas break.